NEW ORLEANS – With the Division II cross country world set for the Pre-National Invitational this weekend there wasn’t much movement to report in the most recent NCAA Division II Cross Country Regionals Rankings that were released by the U.S. Track & Field and Cross Country Coaches’ Association (USTFCCCA) on Tuesday. Of the 16 combined regions of men’s and women’s programs in the country only five saw any kind of movement in its top-five from the previous rankings. The Central, South and Southeast had a slight shake up for the men while the women had changes at the top of just the South and Southeast Regions. In total three men’s and four women’s region had no change at all to its entire top-10. The Rock Pre-Nationals, hosted by Slippery Rock University, will take place this Saturday at the Bob O’Conner Golf Course at Schenley in Pittsburgh, Pennsylvania. The men’s 8K race will get underway at 10:30 a.m. EST and the women’s 6K race will follow at 11:30 a.m. There wasn’t any movement to have in the Atlantic Region as the majority of the teams were off from competition this past weekend. In fact there was no change in the top-10 on either the men’s or women’s side. For the men, Edinboro is the No. 1 team in the region for the fifth-straight week. The top-five was rounded out by No. 2 Shippensburg, No. 3 Charleston, No. 4 Lock Haven and No. 5 Kutztown. For the women, Edinboro remains in the top spot for the sixth-straight week. They were followed by No. 2 Shippensburg, No. 3 Kutztown, No. 4 Seton Hall and No. 5 West Chester. It is the longest time spent in the No. 1 spot to open the season in the region since Edinboro held the top spot for the entire 2014 season which ended with a first-place finish at regionals. While the top-four teams remained the same for the men, a new program entered the top-five for the first time this season. No. 1 Augustana (S.D.) leads the region and is followed by No. 2 Missouri Southern, No. 3 Sioux Falls and No. 4 Minnesota State. The top-four of of the Central has remained the same for five-straight weeks. Moving into the top-five for the first time this year was No. 5 Fort Hays State, the highest mark received for the program since Week Three of 2016. There was no change at all to the women’s side as No. 1 U-Mary, No. 2 Augustana (S.D. ), No. 3 Pittsburg State, No. 4 Oklahoma Baptist and No. 5 Southwest Baptist all held in their previous ranking. In fact there wasn’t a single change to the region’s top-10 for the women. The trend of no movement would continue for at least one more region as the majority of the teams in the East were off from competition this past weekend. The top-five of the men are No. 1 Stonehill, No. 2 American International, No. 3 Southern New Hampshire, No. 4 Southern Connecticut and No. 5 Roberts Wesleyan. While they have changed places through the rankings the top-five for the men have remained with the same teams all year. On the women’s side there was also no change to the top-five as it was made up by No. 1 Stonehill, No. 2 Roberts Wesleyan, No. 3 Merrimack, No. 4 Southern New Hampshire and No. 5 Saint Rose. The top three teams in the region have stayed the same all season. 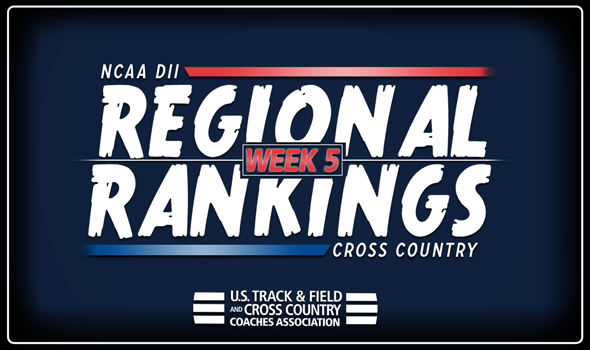 When teams don’t race there isn’t a chance for much movement in the rankings and that is exactly what continued in the Midwest Region. Of the men’s and women’s top-five, only the squads from Grand Valley State took to the course over the weekend. The men’s top-five belongs with No 1 Grand Valley State, No. 2 Saginaw Valley, No. 3 Walsh, No. 4 Malone and No. 5 Southern Indiana while the women’s was made up by No. 1 Grand Valley State, No. 2 Walsh, No. 3 Hillsdale, No. 4 Drury and No. 5 Michigan Tech. It is the fifth consecutive week that the Lakers have held the top spot in both rankings. Neither the men or women rankings in the region had any change to the top-10. The men’s side of the South Region saw a slight shake up to its top-five. The top spot still belongs with No. 1 Lee (Tenn.) but a new No. 2 emerged in Alabama-Huntsville who improved two spots from the previous rankings. No. 3 Embry Riddle (Fla.) and No. 4 Mississippi College each dropped one while Saint Leo held in the No. 5 spot. For the women Lee (Tenn.) also remains as the top team in the region but like their men Alabama-Huntsville shot up the charts, going up five spots to move into the No. 2 position. The rest of the top-five was rounded out by No. 3 Embry Riddle (Fla.), No. 4 Tampa and No. 5 Union (Tenn.). The South Central was unique in the fact that it actually had a lot of teams compete this past weekend. With Pre-Nationals this weekend, if teams did go they raced their B-Team units at their respective meets. Because of this reason there was no change to the top-five on either the men’s or women’s side of the rankings this week. The men’s leader belongs with Adam State with the rest of the top-five going to No. 2 Colorado Mines, No. 3 Western State, No. 4 CSU-Pueblo and No. 5 Dallas Baptist. Adams State is the No. 1 program on the women’s side as well and was followed by No. 2 Western State, No. 3 Colorado Mines, No. 4 UC-Colorado Springs and No. 5 Dallas Baptist. Adams State has held the top spot in both rankings for six consecutive weeks. The Southeast Region experienced one change on the men’s side and two teams with movement for the women programs. Queens (N.C.) is the No. 1 team once again for the men and was followed by No. 2 Mount Olive, No. 3 Augusta and No. 4 UNC Pembroke. No. 5 Anderson (S.C.) climbed one spot to move back into the top-five. Queens (N.C.) is also the No. 1 women’s unit. The rest of the top-five was No. 2 Mount Olive, No. 3 Flagler, No. 4 Anderson (S.C.) and No. 5 North Georgia. Flagler improved three spots from last week to move into the top-five for the first time this year. The West Region will wrap up what should be one of the final times the rankings get so little shake up heading forward. No. 1 Chico State was the top team in the region for the sixth-straight week. They were followed by No. 2 Simon Fraser, No. 3 Cal Poly Pomona, No. 4 Western Washington and No. 5 UC San Diego. There was also no change at all to the top of the charts on the women’s side. Chico State is the No. 1 team for the sixth consecutive week. The rest of the top-five was made up by No. 2 Alaska Anchorage, No. 3 Simon Fraser, No. 4 Azusa Pacific and No. 5 Seattle Pacific.